Nihonbashi Takashimaya was my home for two years. I loved working in the depachika and one of my favorite part of the job was the special food fairs held on the 8th floor of the department store, not in the basement where we were most of the time. Starting this Wednesday through Monday, the 30th, the region that is being showcased is Yamagata. My mother is from here and a big part of our family still lives there. It is always a treat to go to Yamagata for the amazing food and sake. Yamagata is known for having good rice and water, important for the excellent sake. There is usually a corner of jizake where you can try the sake before you purchase it. 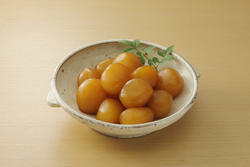 I am also addicted to these konnyaku balls in the photograph above. A nice side dish for any meal or good as a snack with some sake. Look for Yonezawa wagyu, soba, pickles, and in particular any fruit or vegetables. The last day the event closes at 6 p.m. Takashimaya is a short walk from Tokyo station or connected to the Nihonbashi subway station.